A perfectly-aged Corn Whisky from South Africa. South Africa is more famous for its Wines, but there has been serious Whisky production here for more than one hundred years. The James Sedgwick Distillery was founded in Wellington, South Africa in 1886 and they have been producing aged Whiskies here since day one. 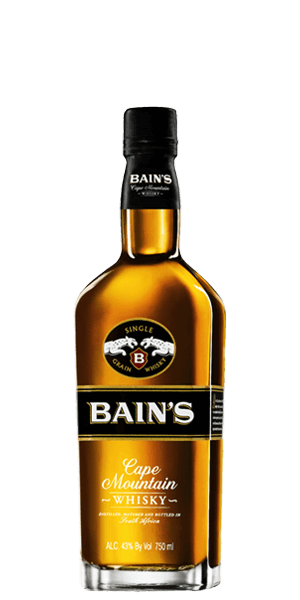 Today, they are the only remaining production distillery in South Africa — producing their world-famous range of Three Ships Whiskies and Bain’s Cape Mountain Single Grain. Bain's Cape Mountain Single Grain is made from 100% locally sourced South African yellow maize (corn). But this premium Whisky has a ton more flavor than most Corn Whiskies because it is double-aged — three full years in first-fill ex-Bourbon casks and then transferred to different set of first-fill ex-Bourbon casks for an additional eighteen to thirty months. This give the dram a flavor similar to a well-aged, high-corn Bourbon itself. And a mighty tasty one at that. What does Bain's Cape Mountain Single Grain Whisky taste like? The Flavor Spiral™ shows the most common flavors that you'll taste in Bain's Cape Mountain Single Grain Whisky and gives you a chance to have a taste of it before actually tasting it. Tons of vanilla, toffee, custard, and florals. Full and balanced with vanilla creams, orchard fruits, oak, and banana. Medium length, smooth, with hints of sweet grapefruit. We loved it. My friends loved it. Iam the hit of the party because no one can find it on line unless you are in the flaviar club. I bought this for my future son in laws family from South Africa and found out they dont like bourbon. Still enjoyed it. Has a smooth caramel flavor and has a oaky finish. Not something to rush out for but is just as enjoyable as a regular Kentucky bourbon. Ordered and drank this bottle a while ago, but I remember liking it. I was expecting more of a corn flavor, but it was still enjoyable. Light and sweet. It’s a bit sweet for my liking... probably better as a higher quality mixer than straight up sipping whisky. This my friends, is it tasty drink. If you're looking for an interesting whiskey... (and we all know what I really mean by that)... If you're looking for a whiskey that will make you seem more interesting than you really are, pick up this South African Queen. With this bottle as a conversation piece in your home, you're sure to lock down your second wife in no time. It's not bad. Pretty strong alcohol flavor up front (even for being a fairly low ABV whisky) but once you get past that the flavor is ok, even pretty decent. It grows on you. Still, probably wouldn't buy it again. This is great for sipping. It’s smooth but flavorful. I was pleasantly surprised by how much I enjoyed drinking this straight. It has a really nice flavor but is pretty light, I also think a whiskey needs a little bite but if you like a super smooth whiskey definitely give this a try. All I can say is I love this whiskey!! I love this whiskey!! It’s smooth without a barky bite!! I like the subtle notes of vanilla and oak and the smooth finish. Not a huge bold flavor. Overall a fun drink. Great aroma and smooth finish. I imagine it would mix well, but I mostly drink straight. As such, the sweetness was a bit too much for me. Sweet maple nose. Orange marmalade on the palate with spice on the finish. Pretty sweet and decent to mix with. I loved this whiskey with a little coke I can taste the vanilla flavor not over powering great mix.will buy again. It is a very good, rich, Single Grain Whisky with a sweet birth, a full life & a long & delicate death. Shared a bottle over 2 nights among 3 people, and a few samplers. Everybody liked it, even some none whisky drinkers. I would hold this up to many of the good bourbons I have tried. But ultimately, I still like a smoky scotch better. Very good light whisky. Good flavier upfront and the finish is smooth. Smooth with a little more spice than i prefer. Not as sweet as I thought it would be. Nice finish. Clean aftertaste. Wasn't sure what to expect - extremely nice surprise to get such taste at this price. Would expect to pay double for this quality. The sweetness isn't "too much" and is a great & unique addition to the liquor cabinet. Nice easy drinking, smooth and unique whisky. May be more of a 7 but for the price, I’ll give it 8 stars. Sweet, but surprisingly balanced. Very smooth. Not much Aroma, and not a long finish. This is a whiskey I could drink all night. It has a bit of a floral aroma that had me worried. But this is an easy sipping whiskey. Vanilla and caramel with a touch of fruit. This is very good whiskey and for the price point, the is awesome whiskey. It is hard to find, but when you do get 2. Amazing. I bought a couple bottles a few years ago, but can't readily find it her in the US. Smooth, clean finish and simple. It's a shame its not readily available here.